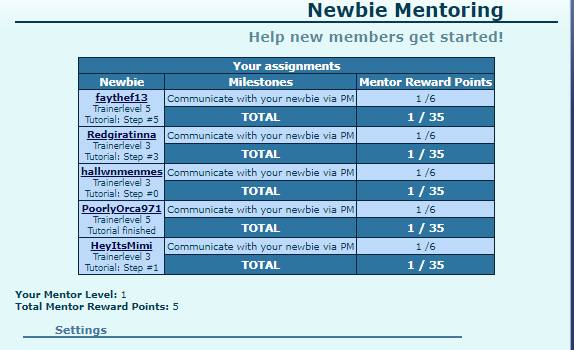 PokeHeroes came up with a Newbie Mentoring Program to help new players feel welcome and supported. This was implemented September 3rd, 2018. I thought it would be a good idea to have a support post for those who are mentors. Share ideas and bring to light any bugs, errors, or trouble spots. Since it started I've had 5 offers to mentor a new player and I accepted all of them. - How many can you have? - What triggers a task? -Max was kind enough to share that there is no limit to the number you can have and triggers stem from the newbie answering the initial welcome PM. The more tasks you complete the more points you can earn. How are you all doing with your new players? Do you have any questions for other Mentors? If we could get questions answered by a Mod, what questions would you ask pertaining to the Mentoring Program of course? I would love to hear from YOU ! Would mentors be given profile tags? Maybe they'd be given after reaching a particular level or a new potential one for each level they complete? I'm not a mentor but wondering that anyways. I love this feature so far, although I am a little disappointed because none of the newbies i've decided to mentor have responded to my PM. Other than that this feature is super exciting! I am having the same issue as Lillypie where none answer my PMs. I wonder if they feel nervous after they join. You have a point Klepto. Nervousness, then just joining a new site, nee people suddenly talking to them. @Klepto - good point. It could feel a tad creepy having a stranger contact you moments after registering. Only having 10 minutes to get the PM out is a wee harsh I think. Minimum of an hour maybe? Within 12 hours for full points. I have been on PH for some time now so quite familiar with the site. There is a tutorial to get you going but if you have any questions along the way or once you get done with that, please feel free to respond to this message. No questions are too silly. We all had to figure it out. I live in the PST - Pacific Standard Time - which is 8 hours behind PH time - so if I don't get to your message right away, that is why. Hope you have a great time!" Yours is so formal XD i just do a simple one like "Heya ^^ i am currently your mentor so please let me know if you need any help ^^"
Yeah, I haven't started the mentoring program, but I can see how a random PM out of the blue may be off putting. BUT- now that you all have mentioned it, it could just seem like a Spam "Welcome" message. I know when I have joined some websites, you get that automated/autogenerated message in your inbox immediately welcoming to the website, etc. So, new users may think it is something like that and not really pay attention or have any indication of actually replying. Also, do the Mentor Points actually allow you to do anything with them? Being shy myself, I completely understand newbies being afraid of interaction (or they're site-savvy enough to do everything themselves), but it's a bit of a disappointment that you essentially stop earning points because the newbies don't respond. It's kind of luck of the draw whether or not you get someone who actually wants/needs help. I feel like the points/level system is a tad bit pressuring to the mentors? It gives a sense that you're failing an objective that's out of your control. @Leapy ~ that is a great point! Our PM could be seen as an auto-generated message rather than a personal greeting. Do you think a message coming a while later would help and not seem so predatory? @PrincessGreenie - I love the idea that to respond to the PM as part of the Tutorial that teaches them how to connect with other users. Just because an envelope pops up on the top they might not have a clue what to do with it. It is rough that we get what feels like a "grade" (an F in this case) and them not responding feels like a big fail even though we have no control over it. Absolutely! Seems later would be a better option. That's my first thought when I join some place new and already have a PM, I usually don't even read it since its a generic "Welcome to ####!" Maybe if it was a later task? After they learn about the PM system and such like PrincessGreenie suggested? After you receive at least one reply on the welcoming/first message, you'll get more task to get more Mentor Points. Also I'd like to point out that in order to the points to go up on the conversation task, they would need to keep answering! If you spam them with message, it won't go up." It would count! Doesn't matter if it's on a different PM. What I tried to say is that it should be like an actual conversation, not only you messaging them, for example; Let's imagine user X is the newbie you're mentoring. You message them (1/6), they answer(2/6), you message back (3/6), you send another message as they didn't answer (3/6, it doesn't move), they answer (4/6), etc. As you can see, in order for it to go up, they need to send a message back. If you send them a message followed, it won't count. I had a newbie that sent a new PM instead of answering the welcoming one I sent, and it counted! Krimes and I were just chatting and another thing that came up is that PMs can be very difficult to access and use on a mobile phone. Also, if you click on it, rad it and change pages it is hard to find again under all the tabs. This is surely a case where PP is much easier to use than PMs. Yes, I know you have to buy the Palpad when you first join... But what if it was just a hotline to your mentor? Then instead of buying the whole thing, you are buying an upgrade to the rest of PH? _TBV_ asked me earlier what we won and I have no clue. The wording of it would lead you to assume there will be a gift/reward somewhere along the way. We also wondered if we mentors would get a special tag like mods have either as we gain levels or after a certain level. Interesting idea.